CC black features a multi-colored name and is layered on D-turquoise and double sided CC black with another colorful name and date featured on the back. The multi-colored theme continues on the smooth white respond card and CC black address label. The handmade D-turquoise envelope gives this creatively colorful ensemble a finishing touch. 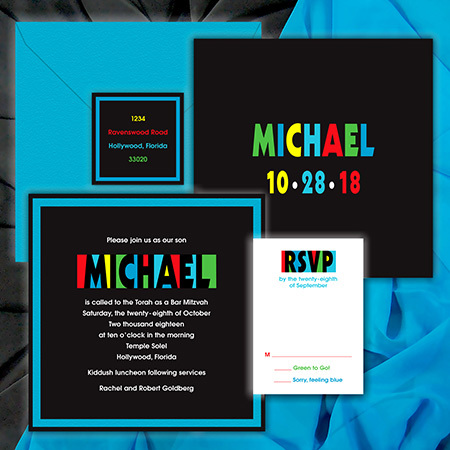 The top and bottom invitation layers and the address label have been layered “under glass” giving them a vibrancy, sheen and thickness which must be seen.